If you prefer the overhead lever design instead of the modern high-arc kitchen faucets with the lever on the side, one model that stands out is the Kohler K-10433 Forte. It’s a versatile unit that is designed to help you get your kitchen chores done quicker and easier. On top of that, it’s also beautifully crafted in an attractive transitional style. So if you’d like to learn more about this kitchen faucet, read on our Kohler K-10433 Forte review. The Kohler Forte comes in an attractive transitional design, so it’s a style that can perfectly fit both traditional and modern kitchens. It’s also a design that can work well for smaller kitchens. It’s a pull-out type of faucet so that height is much lower compared to the high-arc pull-down faucets. This allows creating a more proportionate look for a smaller kitchen. It features 6 inches of spout height and 9 inches of spout reach. So it might provide as much clearance in the sink as the tall gooseneck faucets, it still should be enough to fit there taller containers and other cookware. The faucet offers single-lever operation, which we find very convenient as it makes it easier to control both the water flow and temperature with just one hand. You can move the lever up to turn on the water flow and then adjust it sideways to choose the temperature. Once you’ve finished using the faucet, you can turn the water off at that chosen temperature and the faucet will remember it for next time. You can also pre-set a maximum temperature setting. You’ll especially find this feature useful if you have kids in the house. This will prevent getting your hands scalded. The durable construction is made of metal, so it’s built to withstand wear and tear during the years of use. Additionally, the Kohler finishes are also made to last. They bond to the metal and create a hard surface that resists corrosion, tarnishing and scratches. The product is available in a wide selection of colors. There are the more popular finishes, such as polished/brushed chrome and vibrant stainless. But you can also get the faucet in more rare finishes, such as vibrant brushed bronze and vibrant brushed nickel. With such a wide selection, anyone should be able to find the perfect color for their kitchen decor. The durable performance is also provided by the integration of a ceramic valve, which is considered the industry standard of high quality. 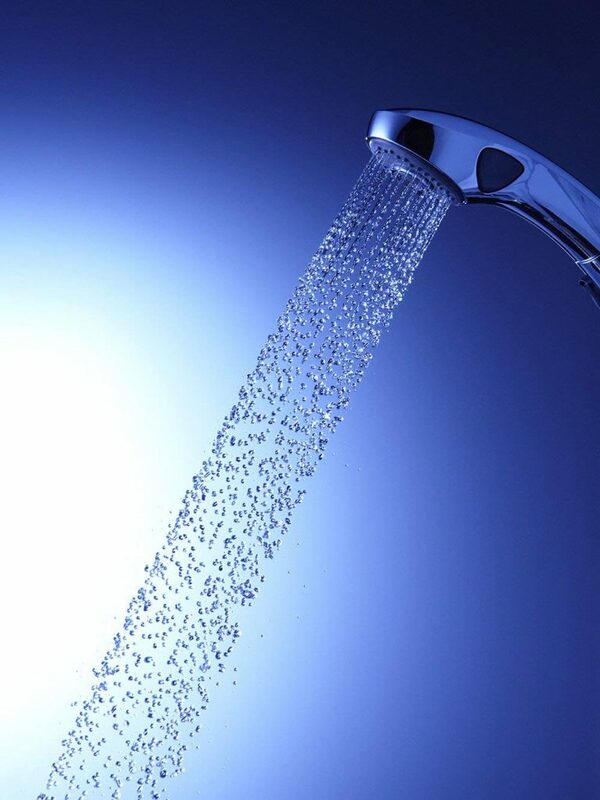 It ensures that the faucet will have a long life without any leak issues. The Kohler K-10433 Forte is designed with pull-out functionality, meaning that the spray head that is located within the spout can be detached and pulled out for extra reach and maneuverability. So, even this faucet is comparatively short, it can still be installed on double basin sinks. You can just pull out the spray head and direct it towards the second basin. Alternatively, you can also just swivel the spout and use the water flow in whatever basin you need. The ProMotion technology makes it easier to use the spray head as it features a flexible connecting hose and a ball-joint that allow all range of motion. A button that is located on the side of the spray wand offers you two function options. The regular stream provides an aerated stream of water that can quickly fill up pots or help you carry out other everyday tasks. The spray mode, on the other hand, is perfect for those situations when you need a more forceful blade of water for rinsing messy dishes. The Forte faucet uses a counterweight for sprayer hose retraction. So, unlike pull-down faucets that have a magnet pulling back the spray head, on this faucet, you need to guide the wand back to its docking position. The fixture comes set up for 1 or 3-hole installation. Depending on your existing configuration, one or the other might be more suitable for you. For 1-hole installation, you can mount it right on top of the sink or countertop, which will make the area look less cluttered. For a 3-hole mount, the manufacturer supplies the hole cover. Kohler offers a limited lifetime warranty. It can help you deal with leaks, drips and other issues. However, it doesn’t include the normal wear and tear of the fixture, as well as any damage that is the result of misuse and abuse. The company also has good customer support that is always ready to provide a prompt response if you happen to have any questions or any issues with your purchase. Durable finishes with a good selection of colors. Pull-out functionality with 2 mode options. 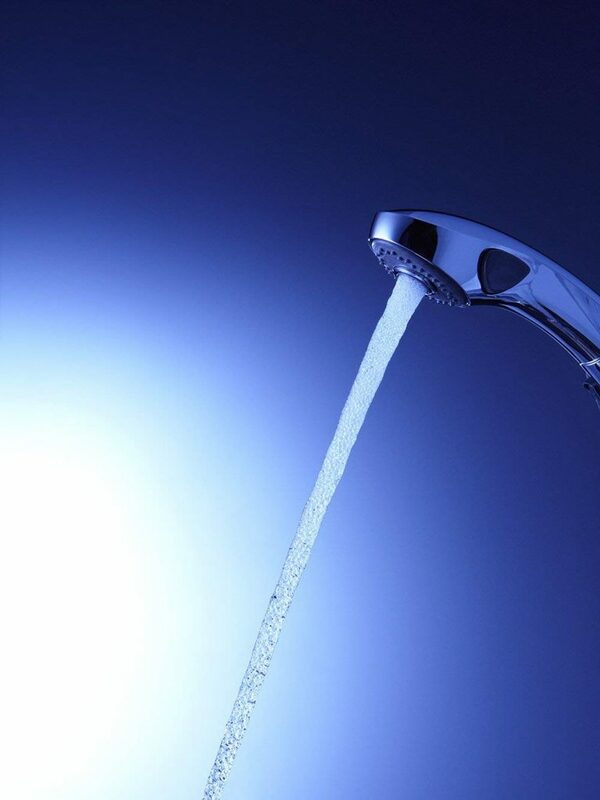 Some of the users experienced problems with leakage of the faucet. The counterweight retraction is of slightly lower quality than magnetic docking systems. Some users have commented that the counterweight wears out over time. It results in that the spray head doesn’t sit snuggly enough against the faucet’s spout. 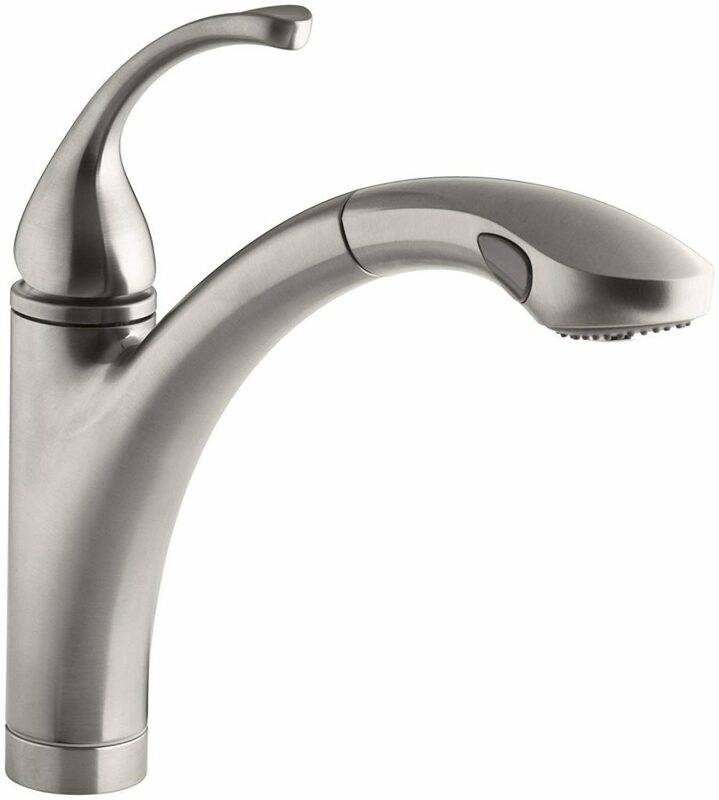 The Kohler Forte kitchen faucet offers the perfect combination of style and functionality. It can nicely blend into the decor of almost any kitchen, creating an elegant overall look. It’s efficient and provides the convenient pull-out versatility. Overall, it’s a durable faucet. And though some users comment on the faulty counterweight system, which is commonly used on pull-out designs, there also a lot of users that have experienced no issues with the counterweight. So as you can see from our Kohler K-10433 Forte review, this product has plenty of advantages and it tops it off with an affordable price.